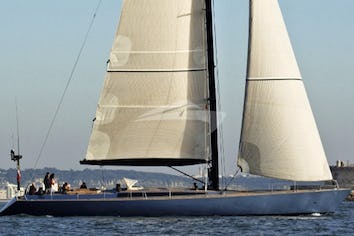 Bare Necessities is a stunning 82’ custom built Oyster, designed to deliver a luxurious sailing experience. From first glance you will notice the stunning hull colour of metallic blue with metallic silver boot top and cover lines. Her size and uncluttered teak deck is perfect for entertaining. The large cockpit with two tables can comfortably seat guests for eating ‘al fresco’. The guest cockpit has four deck computer screens capable of displaying navigation information to guests. 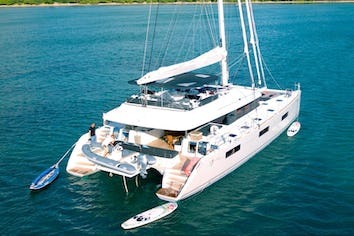 The guest area is over 3m long and has a clear central walkway aft, giving access to the helm positions and side decks. 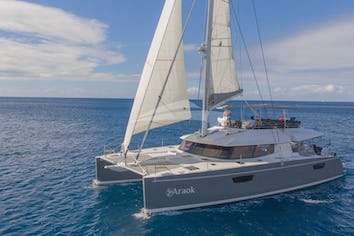 Unlike most 82s, Bare Necessities has a custom built archway above centre cockpit with integrated lights and custom carbon framed windscreen to protect the main companionway providing excellent shelter as well as sun protection. The stern design incorporates a bathing platform trimmed for easy access to the stern deck and swimming ladder. A custom made dinghy platform and carbon davit makes launching and recovering the dinghy extremely easy. In many respects, Bare Necessities represents the most advanced Oyster built to date, the majority of her electronic equipment being typical of much larger vessels. Her powerful cutter rig with carbon Smart boom, top quality laminate sails with main being fully battened, hydraulic furlers all go to provide exceptional performance with minimum effort. Below deck, her maple interior makes her very light and makes for a very open feel. The upper saloon offers excellent views with large deck saloon windows and has a 42” screen neatly flushed in. There is a four-sided wraparound settee surrounding a square, custom, swivel and expanding table which accommodates up to eight guests to dine together in comfort. The lower saloon has a large L-shaped settee with another folding table. This is a wonderful area to read, play games or watch movies on the 32in screen. Bare Necessities provides spacious accommodation for six guests in three cabins, while separate accommodation for crew is provided forward. The master cabin has a spacious centre line queen berth. In addition, there are two identical guest cabins also aft with twin berths. All cabins throughout the yacht have a private en-suite head and shower. Every cabin has a computer screen providing an independent entertainment system, or through the network, can become part of the vessels navigation display. Additional aft berths are available in the form of a sofa berth and Pullman berth. The yacht is currently operated and immaculately maintained, with equipment constantly upgraded by the same professional and fastidious skipper who co-supervised her build. Bare Necessities is an ideal family charter yacht due to child-friendly benefits such as metre-high guard rails, providing extra safety for children on board. Dean has been working on the water all of his adult life. After completing a six year apprenticeship and becoming a Waterman and Lighterman of the River Thames, he spent a number of years working on the River and at sea as a Captain and Chief Officer. Dean is well qualified and holds a commercially endorsed RYA Ocean master as well as a host of other yachting certificates. He has all of the sailing, navigation and maintenance skills required to ensure that guests on board Bare Necessities will be safe and will enjoy their cruise. Dean is happy to give up the helm and allow those on board to do the sailing or he is equally happy to undertake the navigating and sailing allowing his guests to relax and enjoy all that this immaculately kept yacht has to offer. Becky and Dean have been a team for the last 6 years sailing throughout the Mediterranean, Caribbean and America. Becky is well versed in all areas of hospitality and safety. On board she acts as a third crew member, assisting the Captain with sailing and docking but is primarily responsible for the safety and comfort of the guests. She is fully qualified in all aspects of food hygiene and galley operations. Becky received her cookery training at Ashburton Cookery School, one of the UK’s top chef schools. Her breakfasts, lunches and evening meals are always a treat. Becky will assure you that your time onboard will be relaxing, enjoyable and entertaining. Dean and Becky are joined by a third mate to provide additional service and quality to your week aboard Bare Necessities.